Axcient provides business continuity and cloud migration solutions for Managed Service Providers (MSPs). The Axcient Business Availability suite—which includes Replibit, BRC, CloudFinder, Anchor, Fusion, and the Axcient Cloud—enables MSPs to build secure technology stacks for their customers. Trusted by MSPs worldwide, Axcient protects businesses data and continuity in the event of security breaches, human error, and natural disasters. MSPs use data backup and recovery solutions, like Axcient, to provide their customers with continuous access to business-critical services and information. If the cloud service provider experiences a data breach or leakage, the MSP is responsible for any of their customers’ information impacted. Recognizing that there is often protected information stored in data backup and recovery clouds, malicious actors now often target these solutions, malicious actors now often target these. If cybercriminals are successful, the ransomware or malware then infect the MSPs and their customers. SecurityScorecard provides Axcient many different areas of solution, including: Proactive Continuous Monitoring, Risk and Remediation Prioritization, Business Operations and Security Risk Department Synergies, Real-Time Insights, and Decision Making Capabilities. 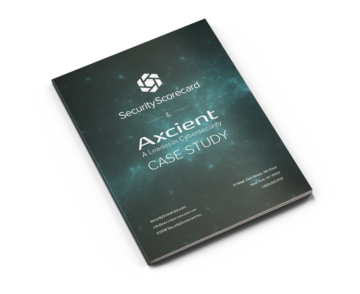 Axcient uses SecurityScorecard’s security rating system to review performance, and ensure that their continuous monitoring also leads to ongoing compliance for a strong security posture. A strong cybersecurity stance requires a corporate culture of cyber awareness. Axcient reinforces this by posting their daily security rating in the office, and leads to staff taking greater care over their cybersecurity. During the onboarding process, Axcient worked with SecurityScorecard’s customer support team to resolve false positives and ensure that the cybersecurity posture they measure and monitor daily is a reflection of their environment’s risk.